Chickens are kind of dumb. They wander around all over and make noises and messes and run if you try to get near them. Or maybe they are lucky that’s all they have to do! That and lay eggs. If there was ever a perfect food I suppose it could be the egg. It’s portable. It doesn’t need refrigeration (although now they say store-bought need to be refrigerated because they have been washed) and it can be prepared in a multitude of ways. It is also a great source of protein! My husband likes chickens. 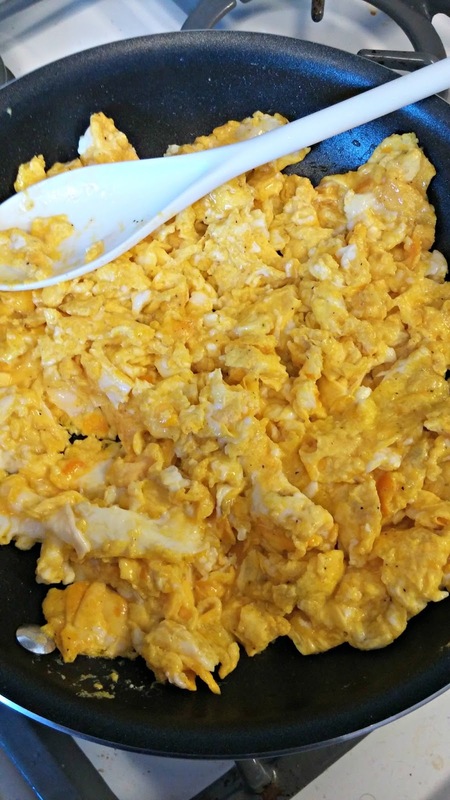 So for the time being I am wealthy…in eggs! He has several different breeds of hens (they all look like chickens to me!) 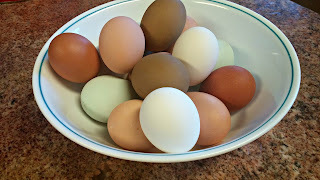 and they lay different colored eggs. We have brown, light brown, dark brown, green, light green, olive, speckled and, oh yeah, white. It’s like an Easter egg hunt with no dye! When the Littles visited a couple of weeks ago they loved gathering the eggs. They brought them in and I scrambled them. I fried them. I even boiled them a dozen and a half which they ate them in no time flat! If they remember anything from their time here, they'll remember that “Mamye can boil eggs really good”! We have so many eggs that I’ve started selling them. I had no idea how to price them so I said $5.00 a dozen or $4.00 if you bring a carton. We had to order cartons to start with so there would be enough. Now people bring me cartons all the time! One day there were so many eggs I had a ‘special’. They were on sale, that day only, for $3.50, carton or not. You wouldn’t think a mere fifty cents would make a difference to people. But it did. When people buy eggs, I open the carton to show them the eggs and to make sure nothing is broken. 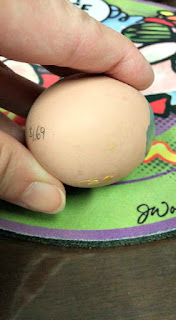 One day someone came and when I opened the carton one of the eggs had a little silver spot on the end. I picked at the spot, wondering what it was. I lifted the egg and looked closely. It said 1.69 on the bottom. It wasn’t real! It was a glass egg! Don't eat it! It's not real!! 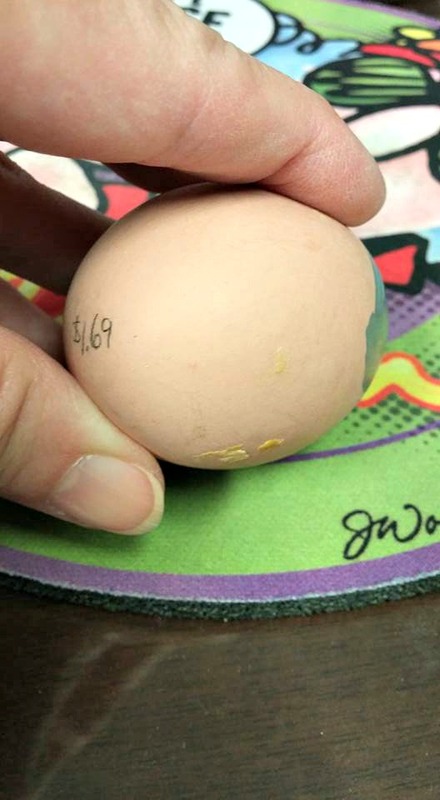 Ceramic eggs are placed in the egg boxes to encourage the hens to lay. They are also there so the hens will lay where they are supposed to and not out in the yard or under a bush. I’ve found eggs in some strange places! Anyway, when the eggs were gathered one of the ceramic eggs was accidentally picked up too! I told my husband and he said the funny thing is there was another ceramic egg, in addition to the one I found, that was missing. That meant two were accidentally put in the cartons. I sent out an email to all the people I had sold to letting them know to watch for a fake egg. My husband did the same. To this day nobody has admitted to finding that lost ceramic egg! I’ve been working on a baby blanket for a friend whose baby was born a while back. 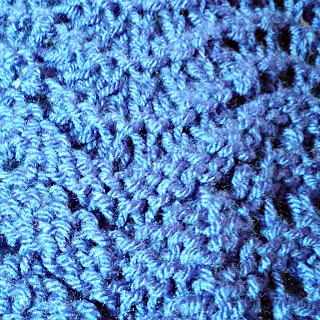 I was finished except for the border and binding off. There was a little time during spring break so I decided to get it done and take it to her. 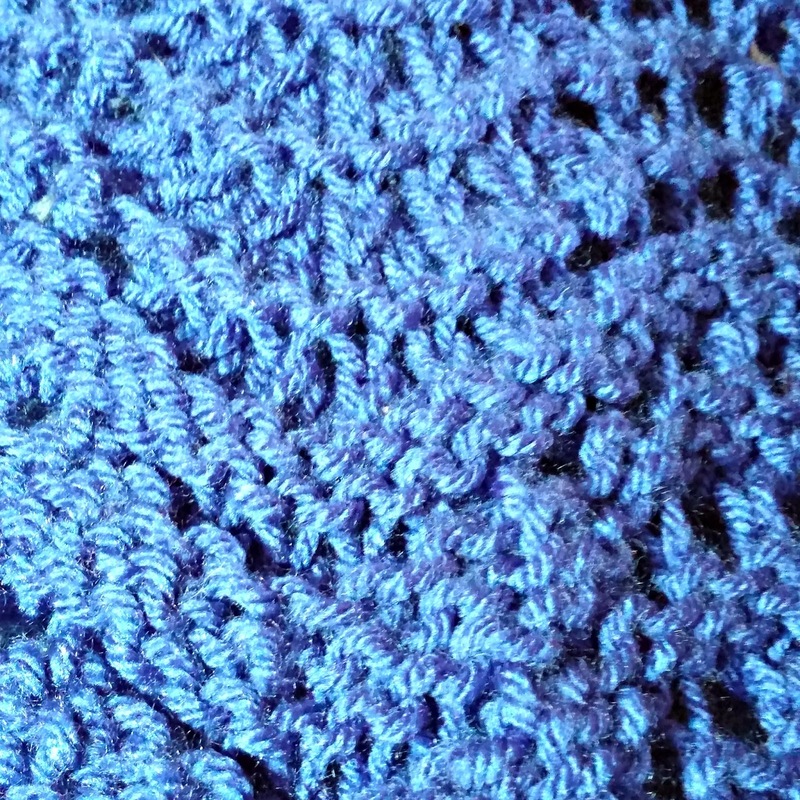 I knitted six rows to make the border and proceeded to bind off the edge. I worked the ends in and it was good to go. That is until I decided to take a picture. Right side/wrong side. See it? That's a lot of mistake!! When I spread it out I discovered that somehow I had switched so that the front was now the back and vice versa. It wasn’t a little bit. It was about a foot worth. Would the ordinary person have noticed? It’s doubtful. But I did so I had to have a do-over. I 'unworked' the ends (and that’s hard when they are hidden well). I pulled out about 15 inches total. I got it all back on the needles and am finally going forward again. I just hate it when I do that! It comes from a chicken not a bunny dummy. I wonder where that fake egg ended up. Curiouser and curiouser! I enjoy reading your blog! I do remember you being somewhat crafty when we were kids. 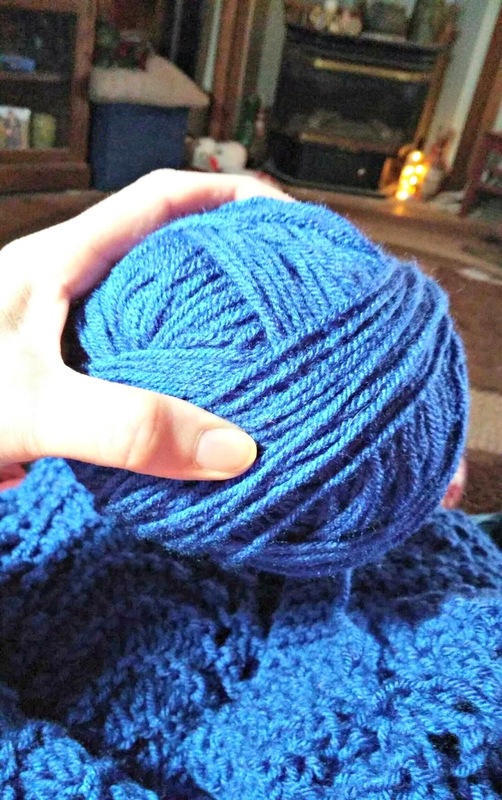 I love to crochet! My mother-in-law taught me. I am now part of a group that makes handmade baby blankets for our local hospital. Each newborn gets a blanket. And we all get an outlet for our work. It's a win-win! I am also a yarnaholic! Your eggs look wonderful.